Opt for comfort in an Amiri leather appliqued camouflage print cotton canvas jacket and a white and navy horizontal striped maxi dress. 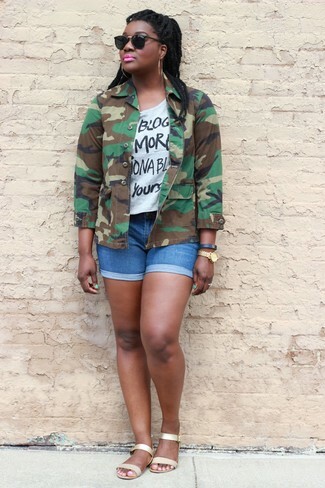 White high top sneakers will add a new dimension to an otherwise classic getup. 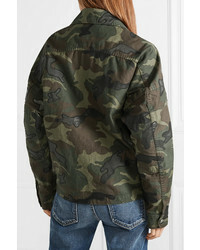 Dress in an olive camouflage military jacket and a black leather mini skirt for a casual-cool vibe. Round off with white low top sneakers and off you go looking smashing. 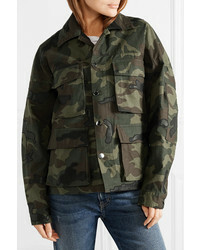 Consider teaming an Amiri leather appliqued camouflage print cotton canvas jacket with a black leather mini skirt, if you feel like comfort dressing without looking like a hobo. Up the cool of your getup by wearing black suede heeled sandals. 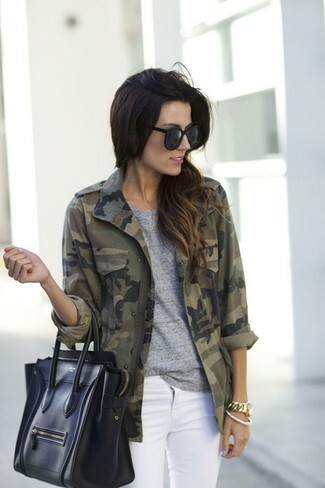 If you're obsessed with relaxed dressing when it comes to fashion, you'll love this extra cute pairing of an olive camouflage military jacket and burgundy leather skinny jeans. Balance this ensemble with white low top sneakers. Try pairing an Amiri leather appliqued camouflage print cotton canvas jacket with a black skater skirt if you're hunting for an outfit idea for when you want to look casually cool. Make black leather ankle boots your footwear choice to kick things up to the next level. 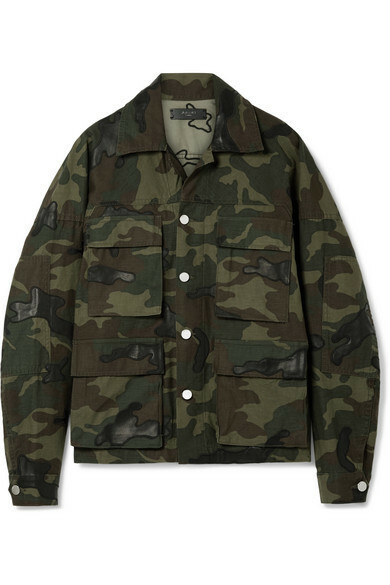 An Amiri leather appliqued camouflage print cotton canvas jacket and black skinny jeans is a great combination to add to your casual repertoire. When it comes to footwear, this getup pairs nicely with tan suede lace-up flat boots. If you're obsessed with relaxed dressing when it comes to your personal style, you'll love this stylish pairing of an Amiri leather appliqued camouflage print cotton canvas jacket and blue ripped skinny jeans. Got bored with this outfit? Enter beige suede pumps to switch things up. 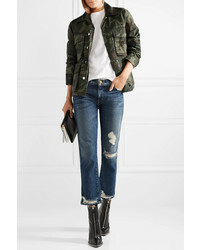 If you're all about being comfortable when it comes to fashion, this combination of an Amiri leather appliqued camouflage print cotton canvas jacket from NET-A-PORTER.COM and white skinny jeans is right what you need. If you're all about practicality dressing when it comes to fashion, you'll love this stylish combination of an Amiri leather appliqued camouflage print cotton canvas jacket and blue denim shorts. Make your ensemble more fun by complementing it with gold leather flat sandals.